Full of good intention I recently signed up for my own blog. Due in part to laziness but primarily a realisation that what I have to say is not as important or interesting as I first thought, it has stagnated in the early stages. Fortunately Constance Harding, a fifty-something housewife from an unknown Surry village, has no such inhibitions. Encouraged by her children – 25 year old Rupert, an IT professional living in Milton Keynes who shows no signs of finding a girlfriend and settling down, and nineteen year old Sophie, currently on a gap year counting sticklebacks in the Ardeche – to write a blog, Constance writes about what she knows best: the trials of having a Lithuanian housekeeper whose skimp polyester lingerie she finds drying in her husband Jeffrey’s study, her attempts at matchmaking at the village bell ringing group, and her disgust at the rise of ready made pancakes. Constance is the comic creation of Telegraph journalist Ceri Radford and the character first appeared in that newspaper as a spoof blog on that newspaper’s website. I hadn’t read that column so I had no idea what to expect from Constance Harding; after just a couple of pages, I had her sussed and pinned down as something of a one trick pony. There’s something really not funny and quite unfair about laughing at someone whose cosseted and insular life makes them behave in certain ways and hold entrenched views; Constance’s opinions are not unpleasant or vicious, but they are stereotypical and I found the first half of the book quite tedious in that Constance does and says everything you’d expect of her. Opinionated as she may be, Constance is generous to a fault, a virtue that sees her get into plenty of scrapes, some of them pushing the bounds of credibility and I found this imbalance between the realistic and the improbable quite annoying. The problem is that Radford doesn’t seem to be able to stick at what’s inherently comical and appears to feel the need to labour a point. There’s a lot of very funny material here, it just gets lost in needless slapstick. The supporting characters are much more interesting than Constance, if truth be told. I adored Natalia the surly Lithuanian domestic; does Natalia really not understand what is asked of her, or does she deliberately misinterpret what she hears to wreak havoc in the Harding household. Jeffrey at first appears to be a long suffering husband in the Jerry Leadbetter vein, but we soon learn that Jeffrey is a rotten cad who is interested in nobody but himself; and the odious Ivan, an old university chum of Jeffrey’s, is a comedic coup de grace. While I did find the high comedy over the top, it does have the effect of emphasising the darker edge that starts to creep in; unfortunately, these darker elements aren’t always drawn out to a successful conclusion and as a result are less meaningful. There’s an interesting sub plot involving Tanya and Mark, neighbours of Constance which threatens to take the story in quite a dark direction but Radford rushes headlong into a disappointing conclusion and wastes a good opportunity to balance the comedy with more sober matters. 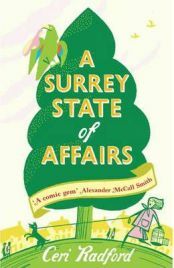 The short entries make A Surrey State of Affairs a good commuting read; you can dip in and out without having to find committed reading time; in this respect I can see why the original blog would have worked, while this novel is endlessly repetitive. Short bursts are fine but extended reading sessions do become tiresome. The moments of real comedy (and I will happily admit to laughing out loud on the daily commute) don’t compensate, however, for the predictable story. Not my cup of tea but I can see why it will be very popular. Thanks to Abacus for sending a review copy. No Comments on "A Surrey State of Affairs"